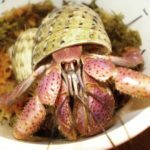 I am a very recent hermit crab owner, only having got my hermit crabs about a week and a half ago. Recently, I spotted a small black cockroach roaming around in there and I have tried many times to catch it/kill it by blunt force and every time it runs and hides under something new. I currently have three hermit crabs underneath the coconut fiber bedding and only one above. I do not know how to get rid of this one little roach and if there are any health risks in having it in there please let me know. P.S. I am not looking for ways to prevent the roaches again, just ways to get rid of this one. Get a straight-sided glass jar, and wipe vasoline in a ring around the top inch of the inside. Take a strip of paper and rubber band it to the outside, with a bit overhanging the opening like a diving board. After dark, remove the above-ground crab for safety and all food from the tank. Add something really pungent to the bottom of the jar like fish food or dog and cat food and place it in the tank. The roach will climb the paper, jump in to eat, and not be able to climb past the vasoline to get back out. If you're lucky it'll happen fast, but it may take a full night or two. I swear this works! I used it to humanely remove feeder babies from my scorpion tanks. Got every last one of them.